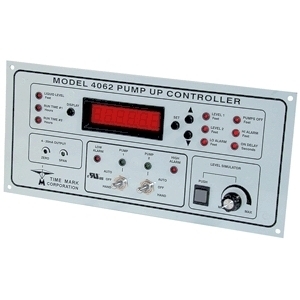 The Model 4062 Pump-Up Controller provides total control for duplex pumping systems. The Model 4062 monitors, controls and displays the liquid level in a tank or reservoir, up to a depth of 34.6 feet. The input to the Model 4062 can be from any 2 or 3-wire transducer with a 4-20mA output that represents 0 to 34.6 feet. A 24VDC regulated probe supply is included. A Level Simulator is provided to aid in programming these five set points; Low Alarm, Level 2, Level 1, Pumps Off and High Alarm. A universal zero to 30 second On Delay can be programmed to prevent outputs from closing due to input fluctuations caused by turbulent conditions. An additional 4-20mA output with zero and span controls is provided for a chart recorder or other external device. 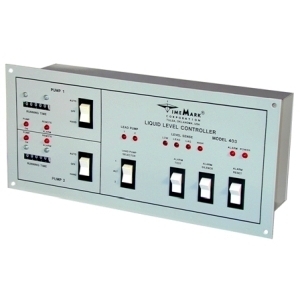 Four heavy-duty 10 amp, 120V contacts are provided for pump control and alarm activation. An auto-dialer or other emergency device can be activated with the SPDT power loss relay. This relay is held open when power is applied. Pump outputs include duplex alternation as well as hand-off-auto switches. Pump run-time can be displayed for each pump with tenth of an hour resolution, up to 99,999. 9 hours. The Model 4062 can be panel-mounted (11 1/8 x 4 5/8), same as Time Mark Models 403, 404, 4042 and 4052, or surface-mounted using the optional surface-mounting kit, Model 4000. Model 4062BT offers Bluetooth communications in addition to RS-485/Modbus. 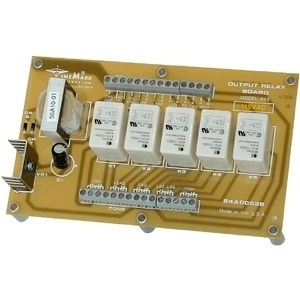 The Model 448 Output Relay Board provides electromechanical relay contacts for the Model 404 or 408 Liquid Level Sensors, allowing those models to be used as a control device. The Model 448 consists of a power supply and five relays on the surface-mounted printed circuit board. Four of the five relays are used with the Model 404. All five relays are used on the Model 408, refer to typical application. 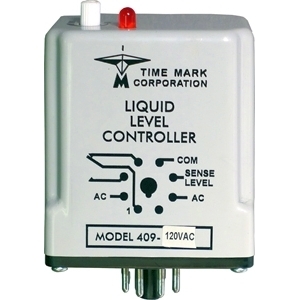 Some liquid level control applications may not require the alternating control, HOA switches, or run-time meters (see the Model 403 or Model 407 data sheets). The Model 404 and Model 408 Liquid Level Sensors uses the Model 448 to meet the needs of direct relay control applications. 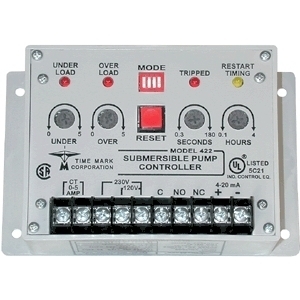 The 403 Liquid Level Controller provides central control of duplex pumping systems. The Model 403 includes pump alternating, visual run-time meters, hand-off-auto control and alarm outputs. Four level-sense inputs interface with float switches, pressure switches, or other level sensing devices which can provide a contact closure. The Model 409 is a compact, socket-mount device for level control of conductive liquids. The internal relay is energized when operating power is applied. When the liquid level reaches the probe, the relay de-energizes. When the level drops below the probe, the relay will reset. A fixed, two-second time delay prevents oscillation due to wave action. Probe cables may be shielded or unshielded. If the liquid container is made of a non-conductive material, a common electrode is required. Other features include an LED indicator to show the output relay status and an adjustable sensitivity setting. The Model 422 Submersible Pump Controller detects an overload or underload condition on all types of running pump motors: suction pumps, submersible pumps, etc. This Monitor detects the actual power used (voltage x current x power factor) and is more sensitive than simple current monitors. The 422 can be used with single phase pumps or, using the Model 276C current transducer, with 3-phase pumps. Matching CTs allow the Model 422 to be used with most pump motor sizes. Optional trip and restart delays are provided.